Well, We Did It! – Let's Go RVing! Well, we did it! We bought a motor home! After months of investigating, researching, visiting numerous dealers throughout the state, communicating by phone and e-mail with people all over the southeast and visiting a couple of RV shows we finally bit the bullet. 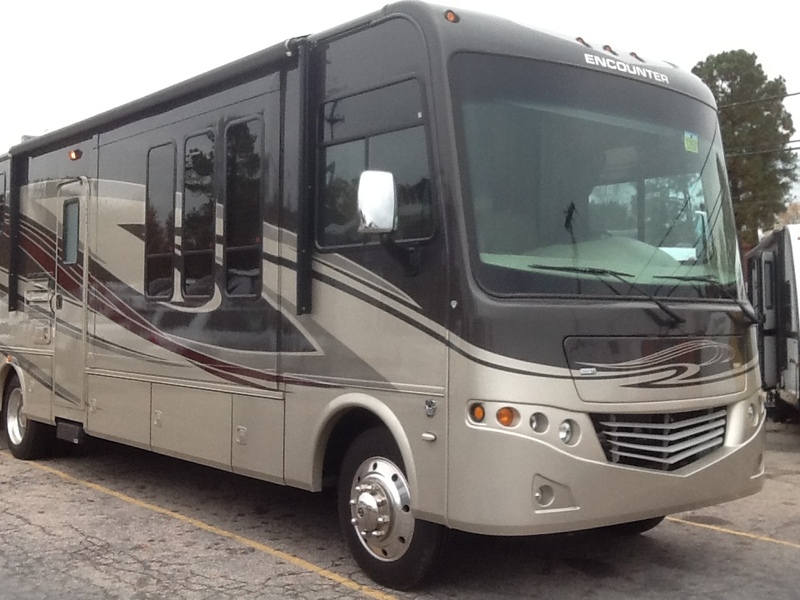 We had seen a 2011 Coachmen Encounter KS in November that was being traded in and we really liked everything about it. In addition to talking with the salesman we were able to speak with the owner who was very upfront about everything that had ever happened to the rig. Although we were pretty well hooked we kept looking and were very open to changing our minds. Then we got the call. The Encounter was in Raleigh and was available anytime we wanted it. Snow delayed our trip but finally on January 15 we headed to Raleigh. We spent about two hours in the coach and then talked with the manager who was very familiar with the coach. We tried to look at everything that we had been told to investigate and also tried to imagine staying in it. It was definitely a go. Our plan was to go to Raleigh on February 27, buy the coach and then stay at the campground at the dealership for thee nights. That way we would have ready access to people who could answer our questions. I cannot say enough nice things about those folks. We were in and out any number of times, sometimes with requests, sometimes with questions. Although I know that they will be glad to go back to work on Monday and see that we are gone they never gave any indication that we were pests! Since we had planned to leave around 12 to get to Raleigh to finalize the purchase I had plenty of time to get ready Thursday morning. We had been buying things for the coach for a couple of months whenever we saw a bargain or a coupon so we had a lot of what we needed. One thing we had decided upon was a new mattress and that was finally purchased the previous Monday evening. The trailer and Forerunner were all loaded Wednesday evening except for our clothes and the minimal amount of food we were taking. I had cooked spaghetti sauce for our Thursday evening dinner and also fixed pimento cheese for sandwiches during the stay in Raleigh. Thursday morning I took care of the food and clothes and while I nervously awaited Jerry returning home from work I started cleaning the house! Nervous energy can get a lot done quickly. We left for Raleigh around noon and looked like vagabonds. We were pulling a trailer with a loaded almost to the ceiling Forerunner. I almost worried about too much weight on the Forerunner! When we got there we met with the salesman, Robbie who immediately introduced us to Richard, the technician who would do the PDI with us. He was very thorough and very patient as I’m sure he felt some of my questions were kind of dumb. Oh well. I also videotaped everything so we could review it as necessary. After we moved inside to continue the walk through we looked at the sofa bed – well, no one had ever seen a bed like this before. The sofa had an air mattress but no frame. After a lot of hot air went in the “head” of the mattress the rest was “resting” on the floor. Needless to say we were not happy campers. After some discussion we came to an agreement. We’re getting a new sofa! Yea! Then inside to finalize the paper work. Afterward, Jerry and I started the task of moving in. That was accomplished quickly as we had organized things fairly well but we were surrounded by bins and not exactly sure where we were going to put things. By this time we were pretty tired so decided we could have homemade spaghetti Friday night and off we went to the Olive Garden. I think the meal was delicious but we were both too tired to really appreciate it. When we got back to the coach it was freezing, literally. The temps were in the 30’s and we couldn’t get the heat to come on. We had the electric fireplace and they are so pretty and will get the chill off but believe me there was more than chill in there. We began to unpack and store some of the bins just to get enough room to maneuver and then – What to do but layer our clothing and go to bed. That was just the beginning! We didn’t have a clock in the bedroom so when I woke up and heard Jerry in the den I assumed it was morning although it was still dark. It usually is dark when I get up so I got up, grabbed my glasses and headed toward him. Immediately he asked what I was doing. It was 3:30 in the morning and he rushed me back to bed. Only two other times in his life has Jerry had a panic attack but Friday morning was one. He had been dreaming that he was standing in an underwater cave and suddenly it started filling up with water and he couldn’t breathe. That’s when he woke up and realized there would be no more sleep for him for a while. He went up in the front of the coach and tried sleeping in the passenger chair and/or sofa. Neither worked so he finally went out to the car. Yes, it was smaller than the coach but it was familiar – and it had heat! We were up early Friday morning anxiously looking out the windows awaiting the personnel at the dealership to arrive. As soon as we saw someone Jerry went out and told them the problem. The original plan had been to completely fill the propane tank before we left on Sunday and we were going to use what was in there until then. Apparently someone misread the meter so we had been without propane, thus no heat our first night. They got right on it and told us they’d have it ready in about 30 minutes. Jerry suggested that we go to Bojangles for a biscuit. I’ve always heard that things get more casual when camping but really. He assured me that we wouldn’t be getting out of the car so the fact that I hadn’t undressed/dressed for the day, hadn’t combed my hair, had no make-up (horrors) and was wearing glasses instead of my contacts wouldn’t matter. Wouldn’t you know we ended up at iHop? Fortunately we didn’t see anyone we knew and the breakfast was fabulous. When we returned the coach was warm as toast no pun intended! We showered and dressed and took off to buy some things we had planned to purchase in Raleigh and also to look for a sofa. We either looked or shopped all afternoon right through lunch. A trip to the container store was successful but sofa hunting was just that – sofa hunting but no success. We returned to the coach and had chips and salsa as an afternoon snack and then later had a great dinner. Two very exhausted people fell into a comfy bed at 9:30 and slept well until the next morning. No midnight panic attacks which would have sent Jerry into the dealership on Saturday morning for a refund! We had planned to go to the State/Miami game at noon but there was still so much to do that we decided to skip that. We went out on errands again Saturday morning and then got back to the coach in time for the game. Homemade pimento cheese sandwiches and hot tomato soup was the menu for lunch. (Love the induction cooktop) While Jerry was listening to the game I went over to two of the coaches on the lot and looked at their sofas and then took Jerry over during half-time of the game. We decided to order one from the dealer if it doesn’t cost an arm and a leg. We’ll know about that Monday when Coachmen opens. The game was so bad that we decided to ride over to Camping World and see their store. We ended up buying a shower basket and a receptacle and then headed back “home”. Around 4:30 we had our first visitors. My cousin and her husband stopped by after the game and we had a nice visit. After they left Jerry and I decided to go out and buy a small ceramic heater just in case. Guess what! We went to Walmart and Lowe’s and neither had any heaters. They were all out. We called it a night, went back and had sandwiches for dinner and again an early night. Boy, did we sleep well again. Sunday morning dawned bright and early for us. It was the day we were to drive home. Of course no one was at the dealership but we felt that we were prepared. As I was showering I realized that the shower wasn’t draining. “Jerry, the gray tank is full”! Oh well, only one of us got a morning shower. We packed up and stowed everything away as best as we knew how and then Jerry pulled over to the dumping station. Tanks were dumped without any issue so we began our trek home, Jerry in the RV and me following in the Forerunner with the trailer. Jerry was concerned about me pulling the trailer that far as I had never done it before but quite frankly I was so worried about him driving the Encounter that I forgot the trailer was behind me for the most part. I put on a podcast by John and Kathy Huggins and headed toward Kinston. Jerry called me several times to ask how his driving was and if he was staying in the lanes as he should. As a former high school coach he has driven many athletic buses so he almost felt at home. He did a great job! We stopped in Kinston to get gas before we headed home. After Jerry had swiped his card he realized that the hose wouldn’t reach so he canceled the transaction and moved the coach around to another tank. When he swiped the card again it was denied so into the store I went. No problem said the lady but how much gas do you want. I had absolutely no idea so I said $30.00. Then we got $30 more and then $30 more. The last time it only took $12 though so hopefully our credit card will be adjusted. We got home and I jumped out of the car, hopped in the coach and we went for a short ride so I could enjoy it a bit. THEN – it was my turn. I got behind the wheel and drove it back to the house on both four lanes and two lanes. I made it without any problems but Jerry said he knew he would be doing most of the driving. I asked him if it was because he didn’t think I could drive or because he was so nervous while I was driving. Both he said! We got home, had a quick lunch and then started cleaning out the things that needed to come into the house. We had planned to leave it at home for a few days while I got it really cleaned but learned that tomorrow night we are supposed to be in the 20’s and get sleet so I guess it’s headed to the warehouse for storage for a couple of week. Oh, winter go away – we’re ready for spring and camping! I called Trent to tell him that we were home and he said they’d be over after Britt’s nap to see it. He said he knew we were glad to be out of “that thing”. I knew then that he had no idea what we had. He was absolutely amazed when he saw it and Eva wanted to drive it! Next trip, March 18 to Raleigh Spring Premier. Woke up to the news that we are going to get sleet and ice tonight with lows in the 20’s. Oh my – what to do? We apparently can’t get electricity to the coach so I e-mailed Jerry who was at work and told him that our best bet would be to use the generator tonight unless we could get it into the warehouse where we have planned to store it. In the meantime I went out and emptied the drawers planning to bring them in the house to vacuum them. Couldn’t decide how to get the drawers out though so short of going out and buying a Dirt Devil or something like that there would be no vacuuming today (we have a central vac in the house). Jerry called me at a little after 10 and said we were to meet the owner of the warehouse at 11:00 with the coach. He had had a bad morning at work (will be so very glad when he retires and doesn’t have to deal with … well, you can’t fix stupid) and was in a stir. As he was rushing home I went out and began to put things back in place to get ready to move it. We went to the warehouse which is fairly big and has several motor homes, 5th Wheels and others, even a boat stored. At $1 a day we have a real deal. The owner said that it never got below freezing in the warehouse unless the temps dipped to 10 for several days. Whew – relief! We’ll be picking it up in less than two weeks preparing for our Spring Premier trip. We had hoped to test towing but haven’t received the tow dolly yet. It will be waiting for us in Raleigh. Unfortunately I will be driving the car following Jerry. I am really ready to ride in it for more than 10 minutes. I guess I could offer to drive. Nope, not yet! Trent called to check on things and said Eva told him she wanted to go to ride in it. Hopefully we can get that accomplished soon.